Coming together of @irfank and @dulQuer raised expectations. But then it often happens that you excitedly wait for a film and it disappoints on release. Say 'road journeys and Irrfan Khan' and two brilliant movies come rushing to the mind – Piku and Qarib Qarib Singlle. Karwaan could have made it a hat trick. As you may have guessed from the trailer, Karwaan is a narrative ignited by a confusion that sets its protagonists – Shaukat (Irrfan Khan), Avinash (Dulquer Salmaan) and Tanya (Mithila Palkar) – on a journey where they get a space to unwind their bewildered lives. While Khan is globally acclaimed, Salmaan has proved his mettle in Malayalam and Tamil cinema. Them being cast together raised expectations. But then it often happens that you excitedly wait for a film and it disappoints on release. The film started on a good note with establishing an introvert Avinash working for a Bengaluru-based software firm. His father is shown in an awkward conversation with Tanya’s grandmother on a bus to Gangotri. The two die when the bus meets an accident and some confusion leads to their bodies being exchanged. Avinash embarks on a journey with friend Shaukat to set things right and soon things turn bizarre. There are forced sub-plots and unnecessary characters. Some sequences take place so randomly that you are left astounded. There are two people travelling together with deaths of people very near to them. But there is neither a sense grief or even a little remembrance of the dead. The characters are stereotypical and most of them have no sanity, save Avinash, who has also buried his head deep inside the mud and is passing his life for the heck of it. He’s too dull for a spark. Avinash is the man from a middle-class family who could not pursue his passion, due to, you know why, the typical middle-class father. His father wanted to play safe and does not like experimenting with career and strictly believes arts is a field for the rich and middle class has no space in it. Bollywood has a habit of stereotyping people and this time it’s Khan. His character plays into several silly stereotypes about Muslims – his love for Urdu poetry, dislike for women wearing short clothes and conversely a fetish for burqa-clad women. Though not intentionally communal, the jokes become stale soon. Tanya looked intriguing in the trailer. But then trailers can be misleading. She is a part of a family which consists of just three people. Her grandmother, mother and herself, all women. One feels like they would have a strong bond but she forgets about her grandmother’s demise because she got drunk. One can express one's grief by drinking, but the grief was hardly visible due to Mithila's flat acting and poor dialogue delivery. The idea of a road-trip film is to see the characters grow through the journey. But that doesn't happen in Karwaan. The film does have its plus points. The visual story-telling is excellent. The landscape between Bengaluru and Kochi is surreal and the cameraman Avinash Arun has handled it with great love. The natural beauty on the route is almost like an independent character in the movie. The music is good, it goes with the feel of the film. Two songs by Prateek Kuhad at beginning and the end of the film are a treat. Chota sa fasana in Arijit Singh’s voice, composed by Anurag Saikia is soothing. It imbibes the audience with the beautiful landscape through the journey. Other songs composed by Anurag Saikia, Imaad Shah, SlowCheeta and Shwetang Shankar are also good and complement the film. Editing by Ajay Sharma is quite good but can't save the shoddy script. Both Khan and Salmaan have performed as per expectation but they couldn’t make much out of it due to paper-thin characters. Special appearances by Kriti Kharbanda and Amala Akkineni go in vain. On the whole, one would not recommend this movie to anyone. It's a waste of talented actors and technicians. It had a good premise but sloppy sub-plots and shallow character-writing destroyed it. I hope Akarsh Khurana learns from this one and works harder on his scripts in future. Verdict: 1.5 stars out of 5. 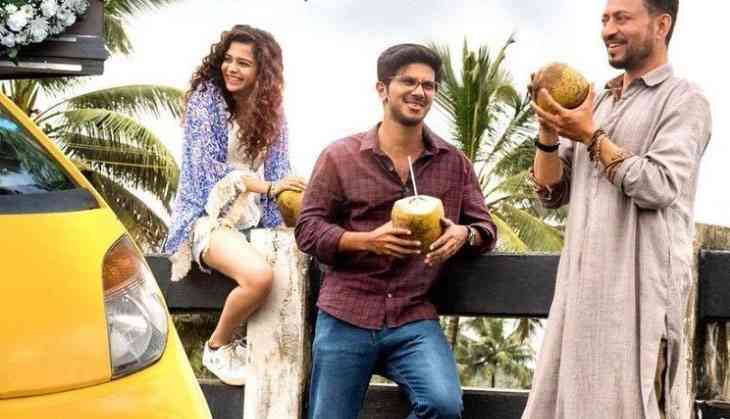 TWEET THIS Karwaan has excellent actors and technicians who have been let down by a atrociously poor script Coming together of @irfank and @dulQuer raised expectations. But then it often happens that you excitedly wait for a film and it disappoints on release.